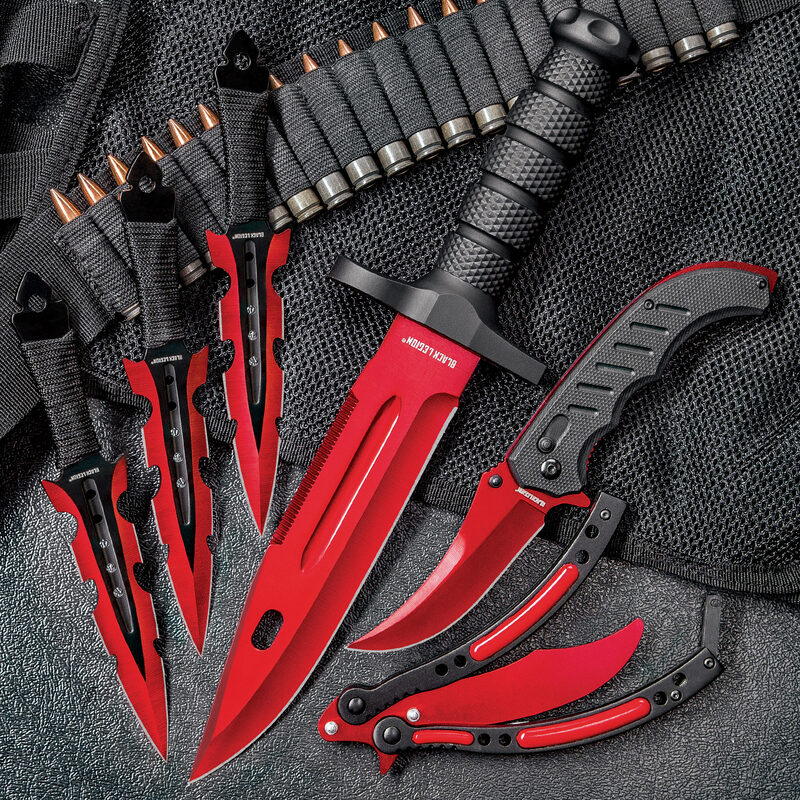 The Black Legion Red Fury Knife Set is just packed with sharp and delicious goodies! You are getting a survival knife, three throwing knives, an assisted opening pocket knife and a butterfly trainer, all with eye-catching, metallic red stainless steel blades. The impressive survival knife has a beefy TPR textured and ridged handle with a heavy-duty guard. The 7 1/2” blade is razor-sharp and features partial serrations on the spine and a blood groove. It comes housed in a tough TPU leg and belt sheath. The ergonomic pocket knife has a grippy TPU handle with a pocket clip and a razor-sharp, 3 1/2” assisted opening blade with a thumbstud and flipper. The set of three throwing knives have cord-wrapped handles and 4 1/2” stainless steel blades with jagged cut-out edges and through holes. All of the throwing knives fit in a sturdy, nylon belt sheath. 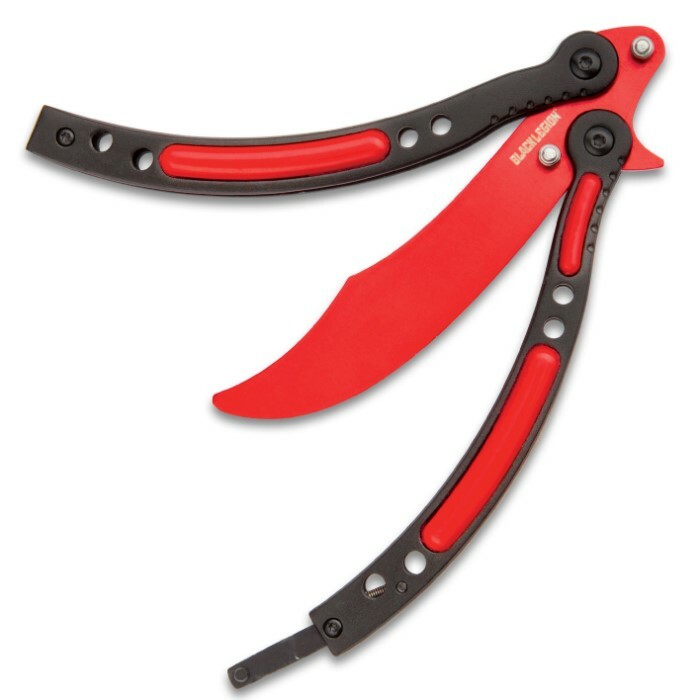 The butterfly trainer has locking aluminum handles with red plastic accents and a stainless steel blunt trainer with no edge for safely practicing your flipping skills. Don’t miss out on this fast and furious set! 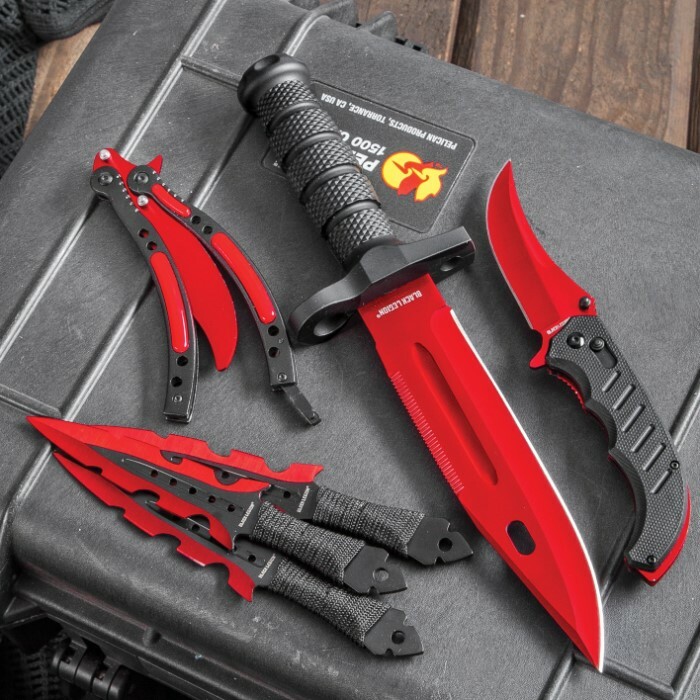 I was excited to see this collection, only to read that the flip knife is a trainer ! But, I am a craftsman and could easily make a real blade for the handle. Then look out ! Otherwise its a good deal for the money. The survival and throwing knives were OK, but the pocket knife will not lock into place and the butterfly trainer fell apart in no time. I am satisfied in this purchase Great color, Nice sheaths, Good Edge, Butteefly is a trainer and very flat but that can be changed. Good knife set for the price. Do not be dumb like me and fully read the description. 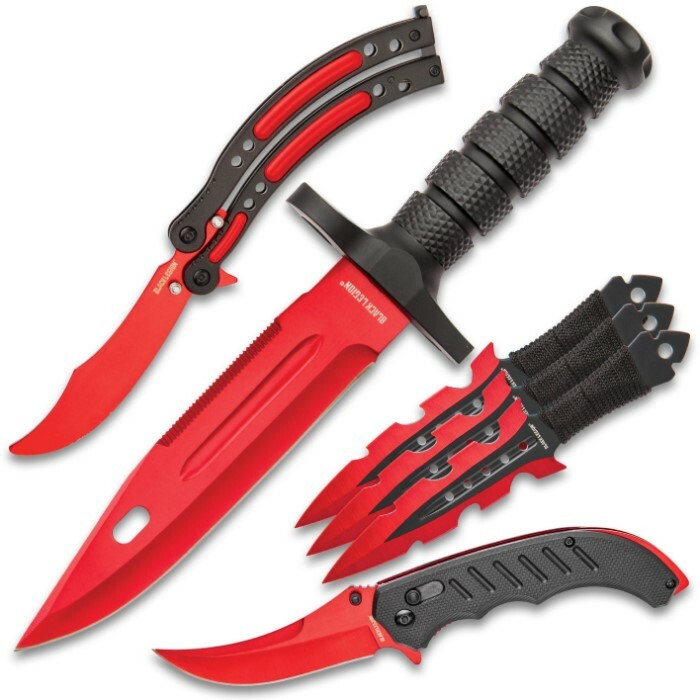 The butterfly knife, as stated, is a trainer and the blade will come completely blunt. 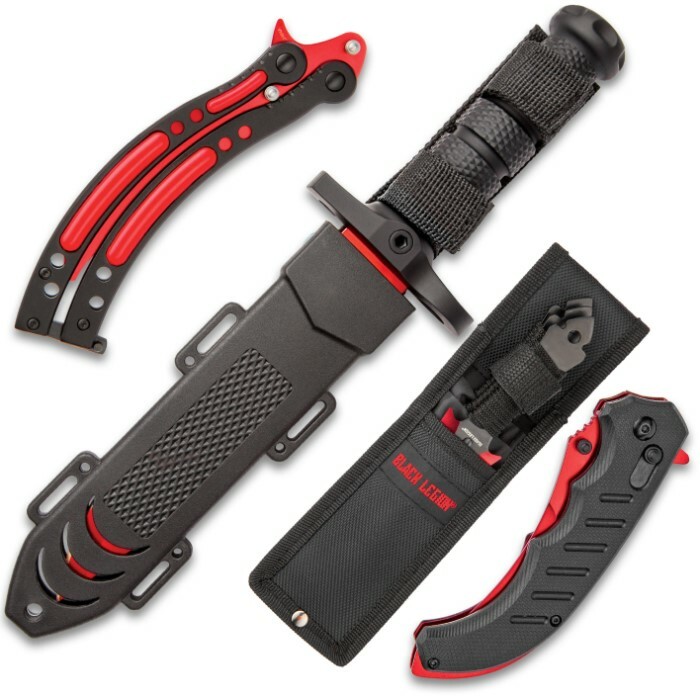 This is a good knife set, and I'm satisfied, but there is a slight problem: the kydex sheath for the survival knife doesn't come with the thigh straps to fully secure it, only the belt strap built into the sheath.